Search & Destroy‘s North Beach headquarters, 1977. Photo by Ruby Ray; courtesy Ruby Ray. Wobensmith wanted to do right by the student curators, who were plotting Void California, a show focused on fanzines and other such “punk-inflected media” produced between 1975 and 1989. The uncertainty led him to Circulation Zero, where Texas collector Ryan Richardson stows digitized full-runs of old punk fanzines. Issue #8, the indexed scans revealed, was the one with the bodysuit. Void California reflected museums’ and university libraries’ increasing interest in the early punk press, recognizing scrappy Bay Area and Los Angeles publications as both visually ravishing objects and essential primary source material. And yet, it’s often noted that publications activated through circulation tend to wither when sequestered and still. Further, the veneer of institutional authority cloaks a circuitous network of fanzine collectors, peddlers, and publishers whose values and quarrels determine access to crucial historical moments. Do vitrines elevate or negate fanzines? Is digitization a viable alternative for preservation, one that sidesteps institutional hegemony? As scholarly interest mounts, the quibbles and convictions swirling around the punk rags of yore significantly impact how narratives form or collapse — and who does the spinning. Who should we listen to? Are the punks who were there estranged from the significance of their own scene, or are they our only reliable sources? Wobensmith, 45, arrived in San Francisco in 1989. Between 1992 and 1997, he published Outpunk and ran a record label of the same name, chronicling the queercore scene that emerged alongside riot grrrl. In 2009, he opened Goteblüd, a perusable, appointment-only fanzine emporium in the Mission District that does most of its business with university libraries; three years later, he donated his personal papers to the Riot Grrrl Collection at NYU’s Fales Library & Special Collections. NOMAG 8. Courtesy Ewa Wojciak. 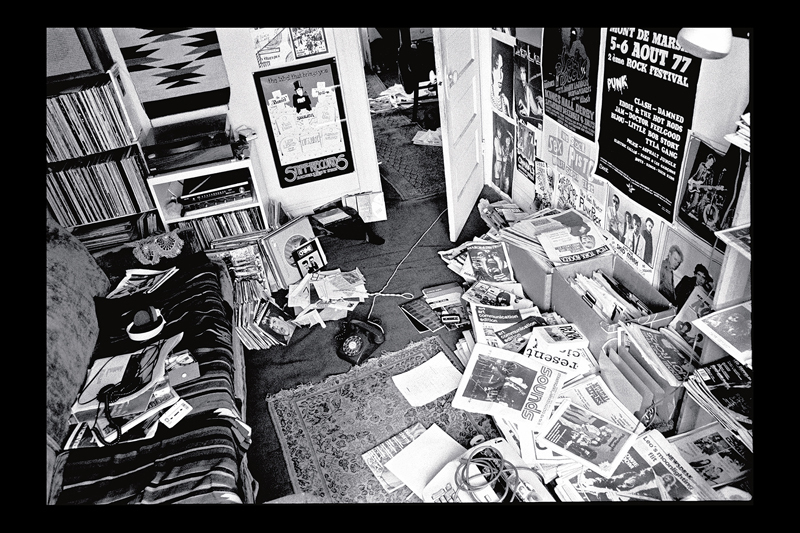 A 43 year-old resident of Austin, Texas, Richardson is the sort of record collector who, once he acquires a label’s catalog, seeks out its stationery. 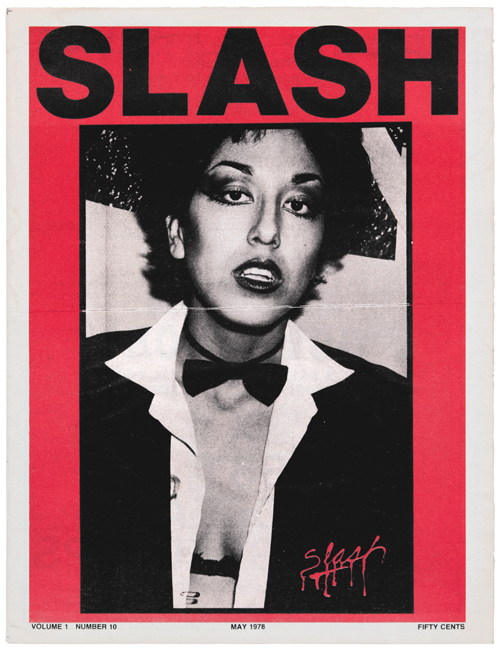 Last year he launched Circulation Zero with all 29 issues of Slash, which ran between 1977 and 1980 and foreran the eponymous Los Angeles punk label, followed by NOMAG. Slash Vol. 1, Issue 10. Courtesy Hat & Beard Press. Earlier this year, he added and then removed a note announcing that, since over 8,000 downloads had yielded a “disheartening” amount of donations, visitors should “consider further uploads on hold for now.” The hiatus was also the result of faltering talks with the publishers of Flipside (which ran from 1977 to 2000), who he did notify about his digitization plans. But if Vale has policed the availability of Research and Search & Destroy online, it’s largely because, unlike most publishers, he’s kept those flagship titles largely in-print and for sale. And this in-house preference helps account for his wariness of institutional archives. “I’m a fan of historical preservation of countercultural material,” he said. “Though I realize it’s being done by the enemy. I come from the days when if there was ever any mainstream interest in punk or industrial or modern primitive, it came with agenda; but it was an opportunity to try to sneak my ideas into mass media in a way where they’d somehow not get too damaged. Other fanzine publishers view analog and digital preservation as complementary rather than opposed. San Francisco’s Maximum Rocknroll — the longest continuously published punk fanzine of its kind — recently launched a campaign to digitize and share back issues and unique items from its archives. 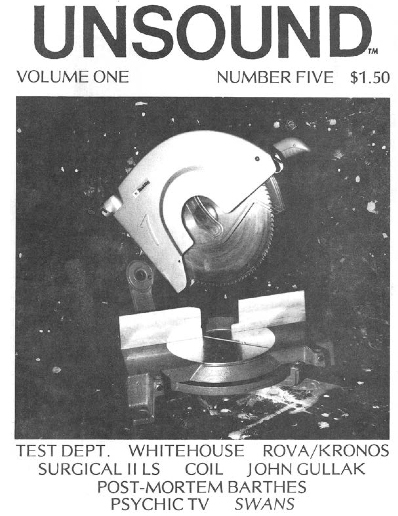 William Davenport — who helmed San Francisco’s Unsound, spiritual heir to Research, through ten issues between 1983 and 1987 — said that he printed full-runs of the fanzine specifically to plant in archives. Recently he uploaded them online himself. Unsound Vol. 1, No. 5. Courtesy William Davenport. The market is the archivist’s menacing shadow, according to Darms, who recently left Fales to work independently as an art appraiser and consultant. In some cases, individuals won’t donate because their possessions have “a market value that you yourself [as an archivist] contributed to creating,” she explained. The incentive for private collectors to sell their holdings piecemeal, she added, only exacerbates the problem. Seen along this trajectory, riot grrrl zines were meaningfully and deliberately injected into the academic ecosystem (which encouraged curators to exhibit the same materials). For many of the riot grrrl publishers and participants who became key donors, their zines’ institutional afterlives actually furthered their original aims. The process is certainly not without particular controversies of its own, but Eichhorn casts “the archival turn” as a necessary intervention in feminist history that upsets received narratives of generational difference. Since riot grrrl zines often appropriated earlier feminist texts, for example, their entry into feminist collections amplifies extant conversations across time. 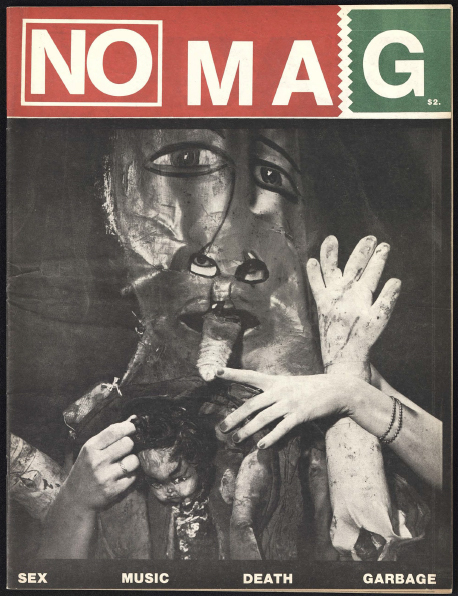 Riot grrrl zines differ significantly from the fanzines that proliferated a decade or more earlier within punk and punk-adjacent subcultures, not least in terms of relative commercialism and format: 1970s and 1980s fanzines more often featured advertisements, mastheads, and traditional journalistic reportage. And perhaps that’s why they’ve trod a craggier path to institutions; the reluctance of some fanzine producers (and their subjects) to relinquish control reflects not only perceived financial incentive but also an urge, as Vale suggested, to continue personally re-reporting and reckoning with their experience. Unlike many of Eichhorn’s subjects, early punk fanzine publishers often consider the institutional archive an obligatory insurance policy rather than a site of productive transformation. Though these fanzines’ value as historical evidence is becoming increasingly pronounced, it isn’t clear that institutions empower them, as Eichhorn writes of riot grrrl zines, “to remain social agents outside their designated time.” And especially not when their writers and subjects still yearn for autonomous value systems and networks. I think you should have asked more than one person who worked on Flipside Fanzine. As a co-owner and editor of Los Angeles Flipside Fanzine from 1979 to 1989I I say go ahead and upload the zines… I have no problem with it…. just keep me informed so I can put it on my site….. Hudley Flipside.